I took my partner to see The Best Exotic Marigold Hotel on Sunday morning. As usual, the British always produce fine films and they have lived up to their standards with this film. For those over the age of 50, as most of the audience were, it is a deep film about life relationships in the past and present, and about seeing people and the world in a different light for the first time. It is about the wonder of human beings set against the bustling beauty of India. Bill Nighy and Judi Dench were two of my favourite actors in the film, but really all the cast were excellent. 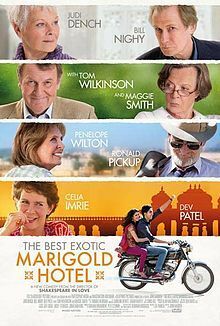 I highly recommend The Best Exotic Marigold Hotel for all to see. It will make you want to jump on a plane to India! Why? It will make you want to jump on a plane to India!